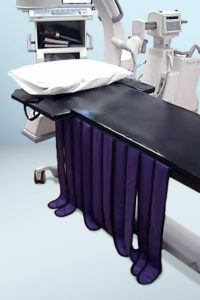 Designed to support the latest advancements in surgical procedures and imaging techniques, and setting the standard for operating efficiency, ergonomics and safety, the Bariatric series of surgical tables provides a flexible solution for the medical and budgetary concerns of all surgical environments.With a 1000-lb patient weight capacity, this table is the only diving board style table on the market to support this weight capacity.The “H” style base allows maximum C-Arm clearance along the entire cantilevered length, and the table can support up to 5 movements, depending upon the model purchased. Carbon fiber, diving board style for easy C-arm access. Large patient capacity – high-end actuator motor supports 1,000-pound loads. An 84″ length can accommodate even the tallest of patients. A 27″ top eliminates the need for arm boards. Two-inch thick, high quality patient comfort pad. Light weight – easy to physically move the table within the room or from room to room. Simple to use, high quality wheel locks. Extreme low position makes boarding patients fast, easy and safe. Hand or foot control available. Designed for easy C-arm access. The Only Cantilevered 1,000 lb, Bariatric Surgery X-ray Imaging Table on the Market Today. The Bariatric Series offers the highest patient weight load in a cantilevered design. This allows the unobstructed C-arm access you are used to with standard diving board style imaging tables. We do this at a fraction of the cost of our competitors who only offer a center post lifting system that interferes with the most important anatomical areas of bariatric patients. Bariatric 3 offers Height (29″ to 41″), Lateral Tilt (+/- 170 ), and Trendelenburg (+/- 200) adjustments. Bariatric 4 offers Height (30″ to 40″), Lateral Tilt (+/- 170), Trendelenburg (+/- 200), and longitudinal travel (10″, +/- 5″) adjustments. Bariatric 5 offers Height (32″ to 42″), Lateral Tilt (+/- 170), Trendelenburg (+/- 200), longitudinal travel (10″, +/- 5″), and lateral travel (10″, +/- 5″) adjustments. For all Bariatric series imaging tables that come with motorized movements, the system includes a remote control for use when positioning the patient.The height buttons support raising and lowering the table top as shown at right. The Lateral Tilt buttons control the lateral angle of inclination. The Trendelenburg buttons control the angle of inclination of the head end. The longitudinal travel moves the table top in the longitudinal direction as depicted at right. And, finally, Lateral Travel moves the table top in the lateral direction.Bariatric series imaging tables with motorized movements require 120 VAC power for operation.